This year’s color trend- pastels. This trend has spread all over other styles, starting from sports,Tomboy to minimalistic and office attire.What’s so special about these colors, anyway? It’s all about the sweetness, every hue makes its wearer look soft and delicate. Starting from blush pink, pale yellow, nectarine orange, sweet sorbets, lavender to mint green and sky blue. 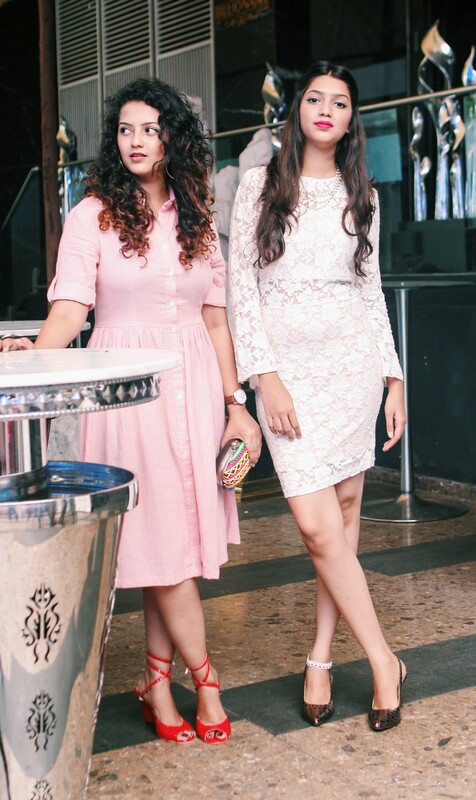 So coming to our Today’s look you will well its all about these lovely blushing colors Pink & Pastels ! Shruti goes for this Triple Shade High Low Dress, Colorful and Vibrant are the words for this Gorgeous piece. This look is for those girls who likes to wear unique Combination and Style them differently. Totally adore this piece designed by Richa Bellani owner of PlushCulture. Have styled this outfit with Pompom Earrings and Pompom Tan Flats. Sanskruti is wearing a Pink Dhoti Styled Tye Dye Drape Dress . Pink is an all time favorite of every Girl which is not to be said. This lovely piece can be styled for any Sangeet or that Reception Function you want to attend. It has a very subtle Indo-western touch and is simple yet breathtaking. To keep look minimalistic she have worn a Golden lariat Neck piece which adds so much of Indianness to the outfit. On Shruti’s Lips- VOV Shade Fushia Pink. On Sanskruti’s Lips- Soft Matte Miss Claire shade Shade 11. Previous articleGirly Girl Or Tom Boy !